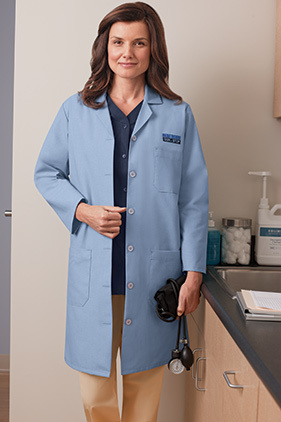 80% polyester/20% combed cotton 5 ounce performance blend poplin ladies lab coat. Princess seams on front and back. Lined notched lapel collar. Exterior left chest pocket with pencil stall and two lower pockets. Side-seamed with side vent openings. 38.25" long (based on size medium).